I'm the mom of two little guys, so I won't making any of these for them, but they make a fabulous shower gift, birthday gift for a little gal (this particular pair was for my niece's first birthday), or a great pair of duds for your sweet one. Pair them with an appliqued t-shirt using fabric from the pants and voila - you've got an outfit that's sure to get lots of oohs and aahs! 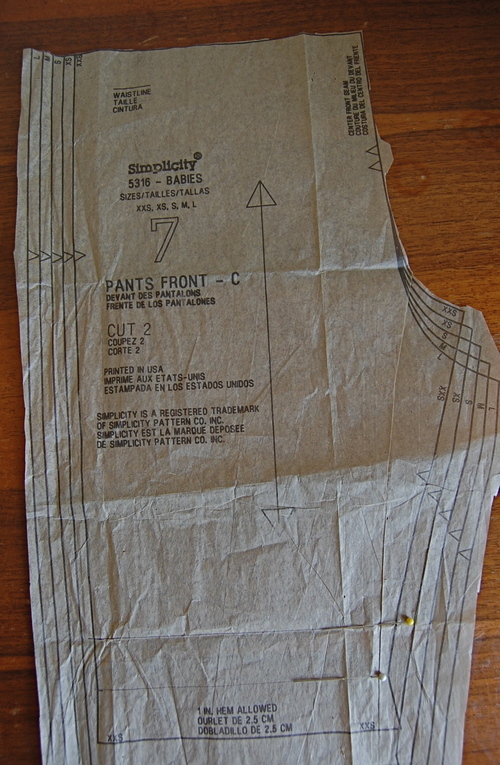 Fabric for pants – use amount called for on your pattern back for your desired size. 1. Start by marking your pattern pieces. Draw a line across the hemline (this is marked by the white pins in the pictures). Then measure up 1” from the drawn hemline (this is marked by the yellow pins in the pictures). This will be your cutting line. 2. 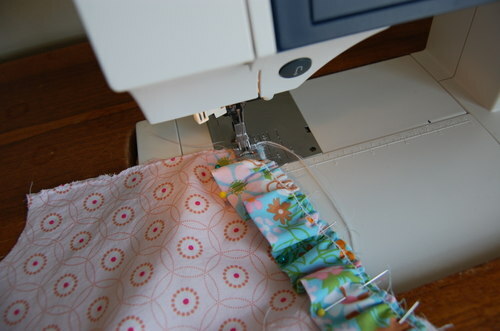 Cut out the front and back pieces from your main fabric. 3. Cut out the ruffle pieces from your contrast fabric. To determine how long to cut these pieces, you will need to measure the bottom cut line that you drew in step 1. 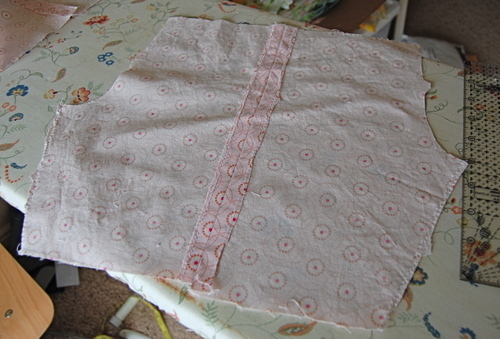 You will want to cut two pieces for the ruffle that are 3” wide and 3 to 4 times as long as your bottom cut line. The bottom cut line on my pattern was 6”, so I cut my ruffle pieces 3” x 18”. 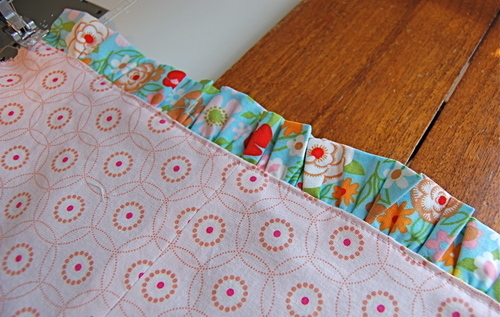 If you want a more gathered ruffle, make your piece closer to 4 times the length of your bottom cut line. 4. 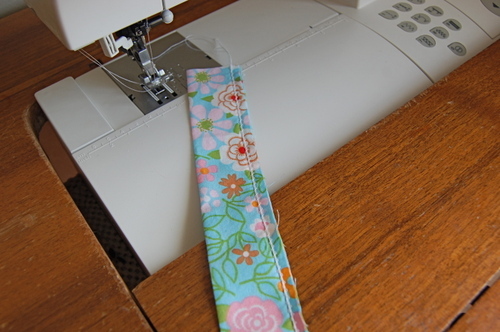 Sew the side seam of your pants pieces by matching the right sides of a front piece and a back piece. Do this for both sides. (There should be instructions for this in your pattern). Press the seam open. 5. 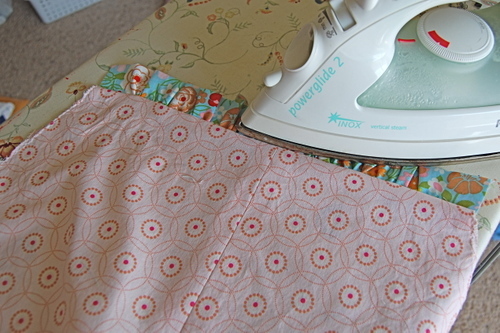 Fold your ruffle in half with wrong sides together and iron it. Prepare the ruffle for gathering by sewing 1/4” from the raw edge over a size 10 cotton crochet thread with a zig zag stitch. You could also use a standard gathering stitch. The crochet thread is a trick my grandma taught me – the crochet thread is much less likely to break than thread when pulling up your gathers. It is especially helpful when gathering longer items, such as skirts. 6. Gather your ruffle piece by pulling on the crochet thread. Work the gathers until they are evenly spaced and the piece matches the length of the bottom of your pants. 7. 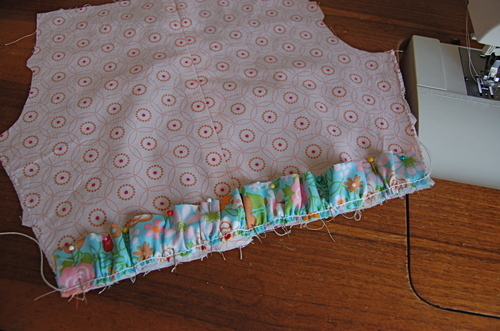 Pin the gather side of the ruffle to the right side of the pants and use a straight stitch to sew the gather to the pants with a 1/2” seam allowance. 8. Iron the seam allowance toward the pant. Turn it over and press well. 9. Edge stitch on the bottom edge of the pant, next to the ruffle for a finished look. 10. 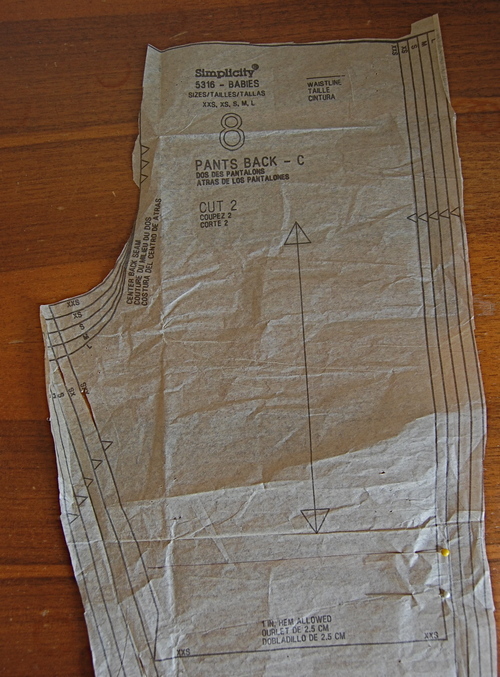 Finish your pants by following the directions in your pattern for inner seam, assembling the pant, and casing and elastic. Please feel free to ask questions. I'd love to see anything you make using the tutorial! So cute! I saw something like this a couple of weeks ago at the mall. Thanks for the tutorial! I was planning on making little K some capris and shorts for the summer(store bought ones don't seem to stay up-no hips I guess) Now I shall put ruffles on some of them! I was planning on making some new jammie pants for Roo. I now thinking they will have ruffles and matching camis. Thanks for the great tutorial. I need to make Calvin a pair (sans ruffle). He loves pull on pants. Maybe I'll make a few for Agnes. Since she needs more clothes...? So, do you leave the crochet thread in, or pull it out after you have sewed the ruffle down? Darling. I might even make some for E. That would be amazing. This has been on my to-do list for Spenser! Thanks for sharing it! So cute! I'm gonna have to make some of these for my girls. Thanks so much for the tutorial Jessi! Ava is going to be getting a pair of these soon. I'll let you know when I get them done. These are totally adorable! I don't have little girls to sew for either, but first birthday gifts are always a good excuse! Wonderful! I will make some for my daughter, and I also have some pants of my own that are too short, and this would be just the ticket to make them perfect! Just wanted to comment that I had bookmarked this to try and I just finished them. Thanks a lot for the excellent tutorial. The pants for my daughter turned out very cute! I finally got around to making the jammies - can you say LAZY. I did make a few modifications but they turned out so cute! Great tute! I put a link on my website to yours! Thank you for the great tute. I am going to make some of these for my Granddaughter. She will be so cute in these. These are so adorable! Great tut!!! I love this pattern. 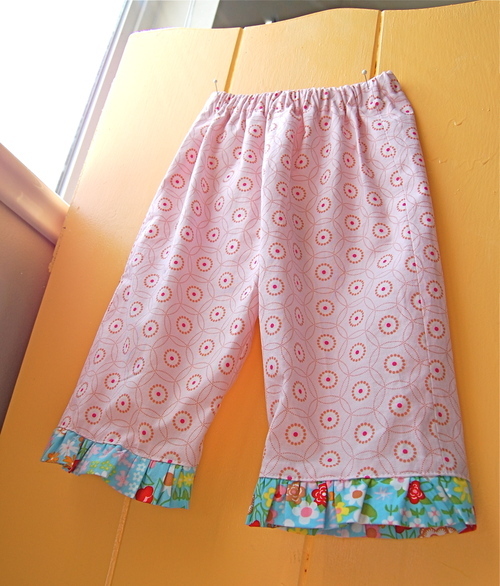 I am some what new to sewing and have been looking for a simple pattern to make my daughters some pants for this winter. Thanks so much for posting this. Just came across this tutorial! Awesome instructions...Do you have any tutorials with double ruffles?? I just found your blog, and I love it! I love the pants. I just love this pattern! The pants are so cute and I really like the the fabric too. Could you please tell me what fabric that is? I'd like to make a pair just like yours. Thank you so much for your pattern I have hunted for amny, many months for this!